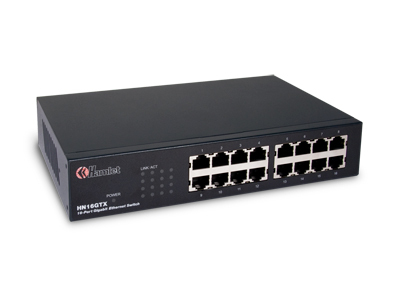 Hamlet 16 ports 10/100Mbps Lan Switch is the ideal solution for small and medium offices for high quality local network. Hamlet Switch is very easy to use, allows you to monitor every single port trough dedicated LED's and it is provided with an intelligent system for automatic speed recognition 10, 100 or 1000Mbit. It is also possible to install it in cascade to expand a pre-existing network. Its Switch technology is also able to perform intelligent data flow on each port reducing the redundant data traffic. The external case is made of metal to perform a better heat dissipation.